Two days ago there was an update in the section of the WR2 manager, today there's an update for the STKit2. 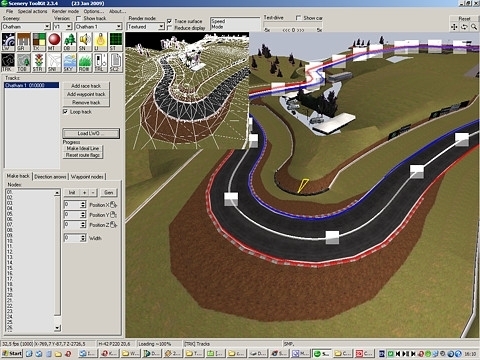 The STKit2 is meant to be used for the conversion of scenerys to be read in World Racing 2. From now on the tool supports more file formats. In the last time lots of new scenerys were released by modder Pischti. All of his scenerys are fully modelled, textured and converted by himself. For that he uses the 3D program Blender, which is free and also able to export lightwave files. These files could not be imported to the STKit2 so far, even though the STkit2 needs the lightwave file format. The reason for that were minimal variances in the file format which resulted in an error at the import. This error has been solved now and by that the possibility to import models from blender directly is given now. At this there is also no need to triangulate the polygons as models with 4-sided polygons are also imported flawlessly. Besides this big step in the development of the STKit2 there has also been an increase of the layer limit so there may be 1024 layers in a lightwave file now and it will still be read. Whoever wants to create gigantic scenerys now may be doing that from now on as the maximum length of a side has been increased to 20km. The limit of 40 squarekilometers still exists though. Without your tools we couldn't mod the Synetic-Games.